I sat through a hands-off demo of Rollercoaster Tycoon World at PAX this weekend, though to be honest I spent a good portion of my time talking to the Pipeworks dev team about the different ways you can torture park goers. From pay toilets and free soda, to blocking off the entrance and trapping park inhabitants forever, to creating roller coasters with the sole intent of rocketing them off the track as quickly as possible, the original RollerCoaster Tycoon was a game that had so much customization you could play out even your most sadistic park manager dreams. And while they were reluctant to confirm or deny my death coaster initiative, from what I saw of Rollercoaster Tycoon World it looks like you'll be able to do much the same thing. Now, for most normal people that may not really be a selling point, but it is an example that proves why I walked away from RCT World a lot more optimistic than I did walking in. 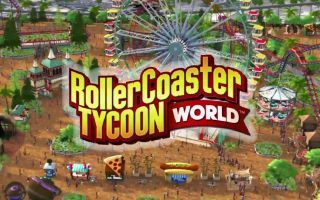 A lot of people, myself included, seemed uncertain as to whether this reincarnated Atari brand would give the RollerCoaster name the due reverence it deserves, and with RollerCoaster Tycoon 4 sounding a sour note with critics, you can be forgiven for expecting the same thing about RCT World. The park demoed to me was broken out into a number of different themes, including '50s Americana, sci-fi, pirate, and Western sections, each with their own rides and shops. The tiny, easily-irritated park goers were still there, as tired and barfy as ever, and still more than willing to let you know their tiny, insignificant opinions. You'll even be able to read the general park consensus from the parks inhabitants in something called the “Park Pulse,” which will aggregate everyone's opinion into easily digestible data. What makes this game different from past Roller Coaster Tycoons, and the explanation for the “World” subtitle, comes from the inclusion of multiplayer. Parks will be broken out into four different sections, each seemingly the size of a regular theme park, and up to four players will be given the opportunity to create their section of the park in tandem. If that sounds worryingly like how last year's SimCity played, I asked and was assured that multiplayer is optional, you will be able to play offline and on your own, and with the exception of a total “park rating” measuring all park sections together there is no way players can negatively affect or stall your own development. You will also be able to explore other people's parks online, and share roller coaster blueprints across the internet. Considering my hesitation walking into RCT World's demo, I left feeling optimistic they'll give the series the respect it deserves. It looked like an proper resurrection of Roller Coaster Tycoon, and the new ideas being put into the game seem like positive inclusions. I just hope they listen to my killer coaster proposal.